I got bit by a winter bug and have been resting for the past two days. What do I eat on such a do nothing day? I prepared Honey-Lime Tea to sooth my coughing and sore throat. For dinner I prepared myself a rice porridge. 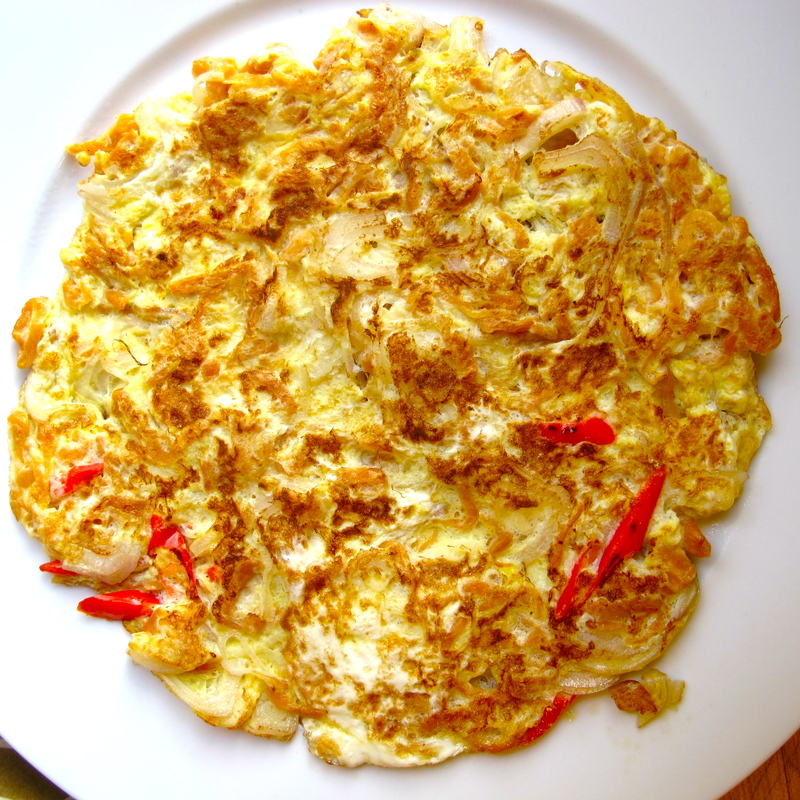 While the rice porridge was on the burner, I whisked up an omelet from an old family recipe – a classic Thai omelet with pickled sweet radish – Kai Jeow Chaipor Wan. I took some pictures to share with you so you could enjoy eating this omelet along with rice porridge – Kao Tom from a recent post. This good gentle food doesn’t take long to cook, another reason why it is good for a day when you are not feeling well. 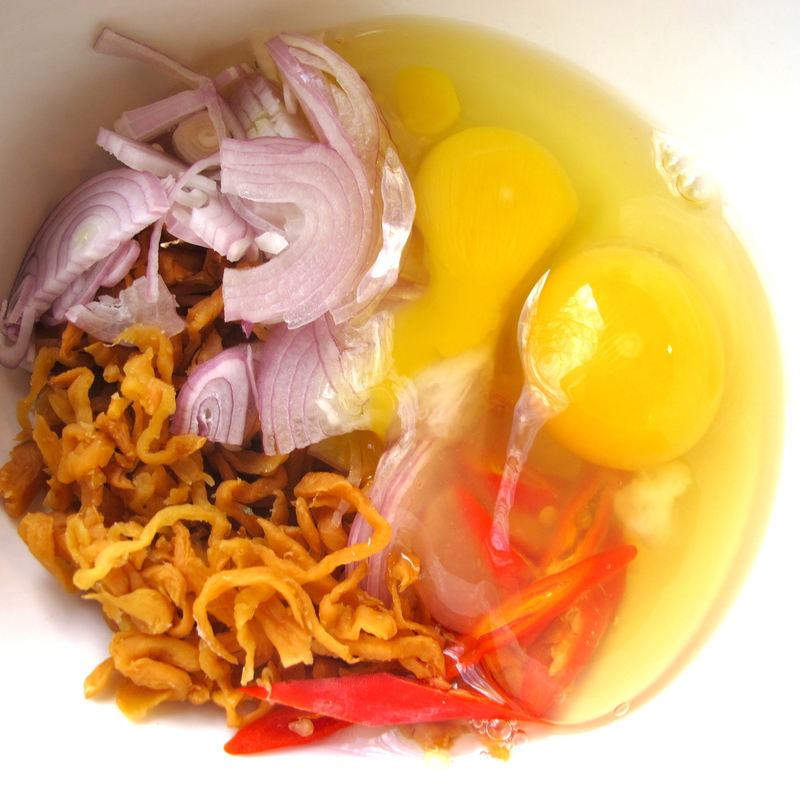 The four ingredients are eggs, shallot, Thai chilies and pickled radish. 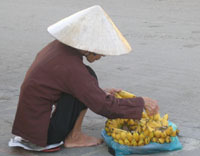 The pickled sweet radish is the same one that Thais use in phad thai, so it is easy to find. You may use dried daikon radish from PCC Natural Markets, but add a squeeze of lime juice and a teaspoon of fish sauce or soy to the recipe. You may also try it with Kimchi and pickled mustard greens; since both are pickled, you do not need to add fish sauce or soy sauce. I hope you enjoy this simple recipe with four ingredients and three cooking steps. Twenty minutes after starting, I had both rice porridge and omelet on the dining table. I enjoyed this warm, down-to-earth comfort food and once again felt like I was at home with my mom and family in Phuket. 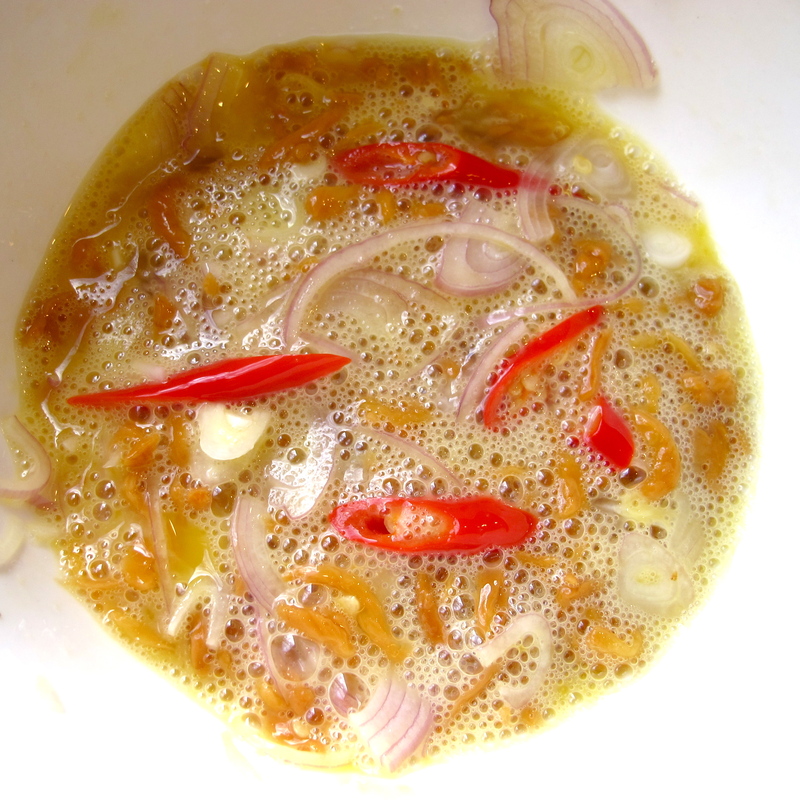 Place shallot, eggs, chilies and pickled sweet radish in a medium size bowl, then beat with fork to mix, about 1 minute. Heat 6-inch cast iron pan or frying pan on medium-high heat. Pour in canola oil and tilt to coat the bottom of the pan. Pour omelet batter in the hot pan, stir quickly 5 times and then let it spread out to cover the bottom of the pan. Turn the burner to medium heat, cover with a lid and let it cook until the bottom of the omelet is dry. Flip the omelet and cook for 30 seconds more. 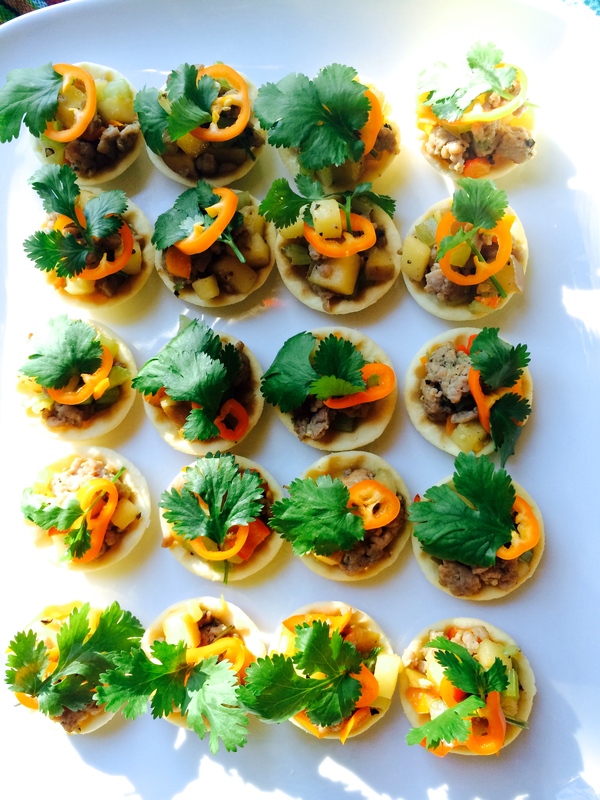 Serve with rice porridge or steamed jasmine rice. First you place shallots, eggs, chilies and pickled sweet radish in a medium size bowl. Then beat it with a fork to mix, about 1 minute.